Welcome to the NNNO Board of Directors! The National Nursing Network Organization (NNNO) is pleased to welcome Elizabeth "Liz" McPhee RN to the Board of Directors. Liz served as the Chair of the NNNO Advocacy Team for the past year and a half. She organized many key fundraising drives that included ticket sales from professional hockey and soccer games in Portland, Oregon. Liz has accompanied Board members to Washington DC and has been instrumental in gaining key endorsements for the National Nurse Act of 2011. Elizabeth McPhee graduated from Portland Community College (PCC) with an Associate Degree in Nursing in 2010. Elizabeth served as Vice President and then the President of the PCC National Student Nurses Association Chapter while in school and led numerous community service projects. Prevention is one of her passions. Liz planned and organized multiple healthy living fairs including a Heart Smart in the Park for children and a Love Your Heart event during February for cardiovascular month. Throughout her education, Elizabeth was recognized for her leadership and scholastic excellence. She was selected to be the Phi Theta Kappa/Coca-Cola Silver Scholar and also received the Oregon Scholar Award. Following graduation, Elizabeth was hired to work on a medical floor at Oregon Health Sciences University. Elizabeth currently serves as a volunteer of the Clackamas County Medical Reserve Unit. She is a member of the Oregon Nurses Association and the American Nurses Association. Elizabeth authored We Need a National Nurse! What YOU Can Do which was published in August 2010 in Working Nurse, a publication that reaches over 100,000 nurses in Southern California. Congratulations on everything you have achieved! I hope you continue to do amazing things. The National Nursing Network Organization is proud to join the American Nurses Association in support of Congresswoman Eddie Bernice Johnson's resolution honoring the service and accomplishments of General Hazel Johnson-Brown. 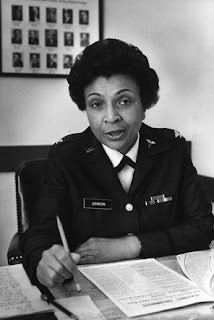 Please join me in paying tribute to Brigadier General Hazel Johnson-Brown, the first African-American woman to hold the rank of General in the U.S. Military Services and the first African-American to hold the position of Chief of the Army Nurse Corps. Gen. Johnson-Brown received her nursing diploma in 1950 from the Harlem Hospital School of Nursing. Gen. Johnson-Brown had originally applied for admission at the West Chester School of Nursing, but was turned away because of her skin color. After receiving her nursing diploma, Gen. Johnson-Brown entered the U.S. Army where she became a pioneering military nurse. Despite facing adversity in the early stages of her career, Gen. Johnson-Brown quickly climbed the military ranks due to her keen leadership abilities and notable skills in the operating room. After a distinguished career in the Army, Gen. Johnson-Brown enjoyed a second career in academia founding and serving as director of the George Mason University Center for Health Policy. I urge you to become an original cosponsor of this resolution which recognizes Gen. Johnson-Brown’s service to her country, as well as her contributions to the nursing profession. This effort is supported by the American Nurses Association. If you would like to cosponsor this resolution, contact Jamie Jackson at jamie.jackson@mail.house.gov or 202-225-8885. Every ten years the Department of Health and Human Services develops a list of priority health indicator topic areas and publishes those as Healthy People goals for the next decade. Assistant Secretary for Health Howard Koh announced the Healthy People 2020 indicators at the American Public Health Association's annual conference in Washington last week. These indicators include access to health services; clinical preventive services, environmental quality; injury and violence; maternal, infant and child health; mental health; nutrition, physical activity and obesity; oral health (which made this list for the first time); reproductive and sexual health; social determinants (a theme that reportedly received a round of applause and has galvanized decision-makers); substance abuse; and tobacco. Assistant Secretary Koh said these areas represent a call to action that will reflect the nation’s health objectives for the next decade, and stated “The indicators are intended to help health and public health professionals assess the health of the nation, facilitate collaboration and action, and help motivate entire communities to action.” He also announced that starting in the new year, the U.S. Office of Disease Prevention and Health Promotion will launch a new monthly series highlighting those who are addressing the leading indicators in innovative ways. "Shoot for the stars," Koh said. "If you only land on the moon, you are still out of this world."